Despite its name, a sweet potato is not a potato and is in fact, a root vegetable. It is a great source of fiber and is full of vitamins, minerals, calcium, and iron. 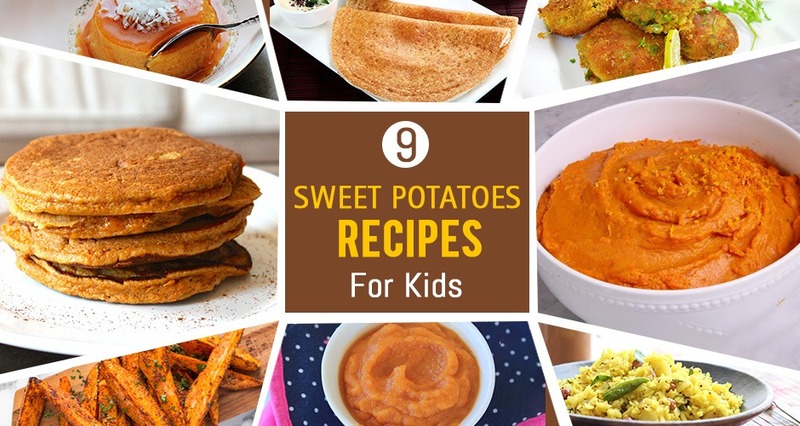 You can try these easy sweet potato recipes for kids. As a soft and appetizing side dish, it is naturally flavorful in every bite. Loaded with antioxidants, it provides a multitude of health benefits and is especially good for babies as it helps boost their growth and development. It also aids in better digestion and is a satiating meal for the little ones. Mashed sweet potato is a favorite amongst most babies. It tastes delicious and is super filling as well. Wash the sweet potatoes and cut them. Pressure cook the sweet potatoes for 2-3 whistles and mash them. Add butter and puree in a pan along with cardamom powder. Fry them, cool and serve. The combination apples and sweet potatoes is a winning one and present a wonderful choice as the first food for babies. This sweet potato recipe is a great one. Wash and peel an apple and a sweet potato. Chop them in medium-sized pieces and steam them for 10 minutes. Blend them in a blender and serve the puree warm. Have you ever tried mixing some idli/dosa batter with some sweet potato? If you haven’t, now is the time to do so. You can make this as either a sweet or savory dish. Add (washed and grated) sweet potatoes, brown sugar, coconut, and powdered cardamom in a blender and grind them. Add this mix to the dosa batter and stir well. Heat a pan, and spread the mix over it. Cook until brown from one side and flip the dosa. Repeat the process for the other side and serve. While babies throw tantrums when fed vegetables and healthy soups, your little one might just love this one! Soak almonds in water and set aside. Add butter, ginger, and garlic in a pressure cooker. Add the carrots and sweet potatoes. Cook them for up to 3 whistles. Transfer the ingredients to a blender along with the peeled almonds and grind them. Add butter and paste along with pepper powder and boil it, then serve it. Sweet potato pancakes are easy to make and a healthy way to sneak in some vegetables into your growing baby’s diet. Cook the sweet potatoes for 2-3 whistles in a pressure cooker. Peel the skin and mash them. Heat brown sugar with water in a pan. Add wheat flour, mashed sweet potatoes, and banana in brown sugar water. Heat a pan, add a ladle of batter to it and spread it. Cook until brown on one side for five minutes, flip the pancake and serve it. It is an easy healthy breakfast made with flattened rice & sweet potatoes. Wash and cut some sweet potatoes and set them aside. Soak flattened rice in water. Squeeze the water from flattened rice. Add oil and onions in the pan. Add sweet potatoes and cook it. Add soaked flattened rice and mix it well. Squeeze a lemon over the mixture and serve. Sweet potato wedges are fried snacks. It is the best alternative to regular chips for kids. Wash and peel sweet potatoes and cut them. In a separate bowl, add olive oil, chili powder and mix them. Add slices to mix and shift them into a tray. Fry them in a pan until it’s cooked well. It is a healthy snack made with sweet potato. Pressure cook sweet potatoes for 3 whistles then mash it and set it aside. Add mentioned spices along with mashed sweet potatoes, Bengal gram flour, and rice flour. Mix everything and roll it into patties. Then add oil and fry the cutlets. It is an easy and healthy dessert made with sweet potatoes, brown sugar and ghee for toddlers. Peel and slice sweet potatoes and pressure cook them for 1 whistle. Heat brown sugar in a saucepan and add cooked sweet potato discs to it. Boil it and add ghee in it and cook for 2 more minutes and then serve it. Sweet potatoes are healthy and rich in proteins. Make sure that the ingredients you are using must be good and clean before you use them. Let your little one grow along with the new tastes of sweet potato so that he acquires all the proteins needed and leads a healthy life.